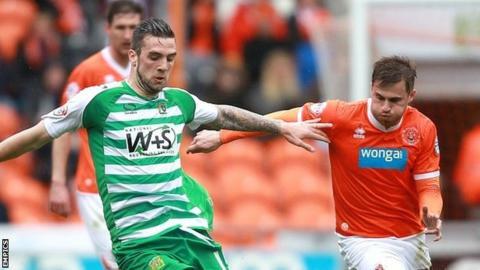 Yeovil ended a run of six games without a win after victory at Blackpool but remain bottom of the Championship. They went ahead after Tony McMahon was adjudged to have handled in the area and James Hayter's resulting spot-kick went in off the post. David Goodwillie fired over for the home side, who went two down when Tom Lawrence, on-loan Manchester United, fired in left-footed. Substitute Elliot Grandin pulled one back from 25 yards but Yeovil held on. It completed a league double for the Glovers following their 1-0 success at Huish Park last December, but they are still a point behind Millwall and Barnsley and three away from Charlton and safety. Both sides had early chances, Goodwillie could not quite lift the ball over Yeovil goalkeeper Chris Dunn and at the other end Liam Davis hit a powerful left-foot shot just over the bar. After Hayter's penalty, Gary MacKenzie headed an excellent chance to equalise over the bar but Blackpool were booed off by their supporters at the break. Home goalkeeper Matt Gilks kept out a close-range effort from Joel Grant, but after Goodwillie blazed over from 12 yards when one-on-one with the keeper, Lawrence was slipped in down the middle and struck low between the legs of Gilks. Grandin's dipping shot from 25 yards crept just under Dunn's bar after 78 minutes and the hosts laid siege to the Yeovil goal in injury time in search of an equaliser, but Andy Keogh's shot from 20 yards whistled over and they could find no way back. "There's 18 points to play for so we need to pick up as many as we can." "I'll put it down to a bad day at the office. But I'm hurting because I know those boys inside out and that's not the way they want to play. "The only good thing about it is that we've got a game in 72 hours against Derby and we can put this game to bed. "We need to improve on everything. I need to go away and have a long hard think about what to do on Tuesday." Match ends, Blackpool 1, Yeovil Town 2. Second Half ends, Blackpool 1, Yeovil Town 2. Attempt missed. Elliot Grandin (Blackpool) right footed shot from outside the box is close, but misses the top right corner. Attempt blocked. Andrew Keogh (Blackpool) right footed shot from the centre of the box is blocked. Assisted by Craig Cathcart. Seth Nana Ofori-Twumasi (Yeovil Town) is shown the yellow card. Corner, Blackpool. Conceded by Tom Lawrence. Attempt missed. Anthony McMahon (Blackpool) right footed shot from the right side of the box is high and wide to the left. Offside, Yeovil Town. Luke Ayling tries a through ball, but James Hayter is caught offside. Foul by Gary Mackenzie (Blackpool). Tom Lawrence (Yeovil Town) wins a free kick on the left wing. Attempt blocked. Tom Lawrence (Yeovil Town) right footed shot from a difficult angle and long range on the left is blocked. Attempt saved. Joe Edwards (Yeovil Town) left footed shot from outside the box is saved in the centre of the goal. Assisted by James Hayter. Substitution, Yeovil Town. Kevin Dawson replaces Joel Grant. Substitution, Yeovil Town. Ruben Palazuelos replaces Liam Davis. Anthony McMahon (Blackpool) wins a free kick on the right wing. Goal! Blackpool 1, Yeovil Town 2. Elliot Grandin (Blackpool) right footed shot from outside the box to the high centre of the goal. Assisted by Andrew Halliday. Attempt missed. Andrew Keogh (Blackpool) right footed shot from the left side of the six yard box misses to the right. Assisted by David Perkins with a cross. Attempt blocked. Joe Edwards (Yeovil Town) left footed shot from the centre of the box is blocked. Assisted by Liam Davis. Goal! Blackpool 0, Yeovil Town 2. Tom Lawrence (Yeovil Town) left footed shot from the centre of the box to the bottom left corner. Assisted by Luke Ayling. David Goodwillie (Blackpool) wins a free kick in the defensive half. Liam Davis (Yeovil Town) wins a free kick on the left wing. Corner, Blackpool. Conceded by Byron Webster. Substitution, Blackpool. Tom Barkhuizen replaces Chris Basham. Substitution, Blackpool. Elliot Grandin replaces Neal Bishop. Andrew Halliday (Blackpool) wins a free kick in the defensive half. Foul by Joel Grant (Yeovil Town). Attempt missed. Chris Basham (Blackpool) header from the left side of the box misses to the left. Foul by David Goodwillie (Blackpool). Shane Duffy (Yeovil Town) wins a free kick in the defensive half. Jamie McAllister (Yeovil Town) wins a free kick in the defensive half. Attempt missed. Neal Bishop (Blackpool) header from very close range is close, but misses to the left. Assisted by David Goodwillie with a cross. Attempt missed. David Goodwillie (Blackpool) right footed shot from the centre of the box is close, but misses the top right corner. Assisted by Neal Bishop. Substitution, Blackpool. Andrew Keogh replaces Apostolos Vellios. Chris Basham (Blackpool) wins a free kick in the defensive half. Foul by Joe Ralls (Yeovil Town). Attempt missed. Tom Lawrence (Yeovil Town) right footed shot from outside the box is high and wide to the right following a set piece situation.